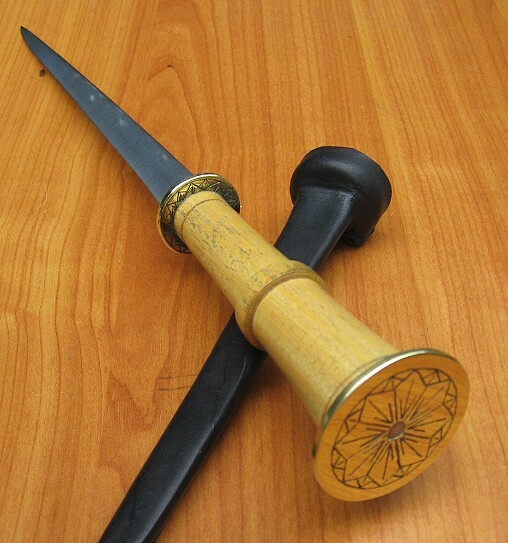 In keeping with other similar threads, here's a place to show off your rondel daggers. Here are a the rondel daggers in my own collection. This one is based on a late 14thC River Thames find. 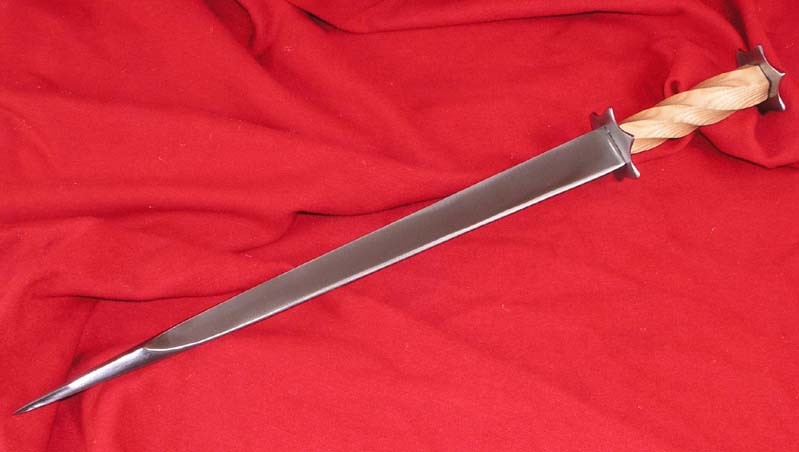 Blade is 19", diamond cross-section. 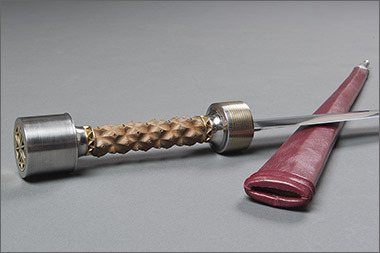 Hilt is Box, spiral-wrapped with copper wire. Here is one that Chris made himself several years ago. 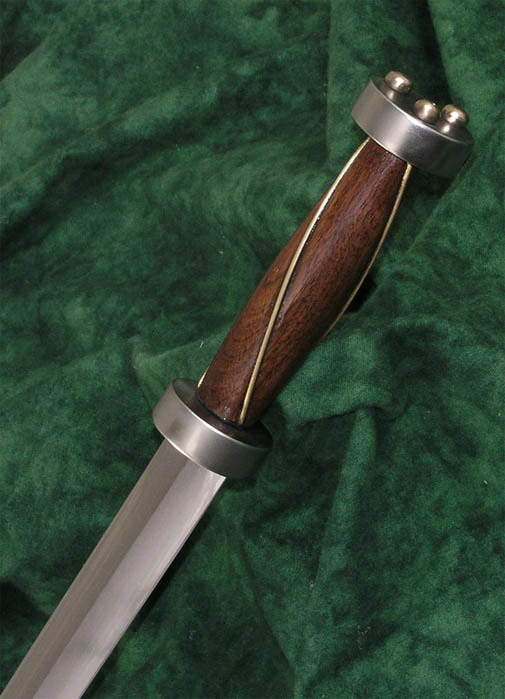 concering the rondel dagger, that Chris made himself several years ago. 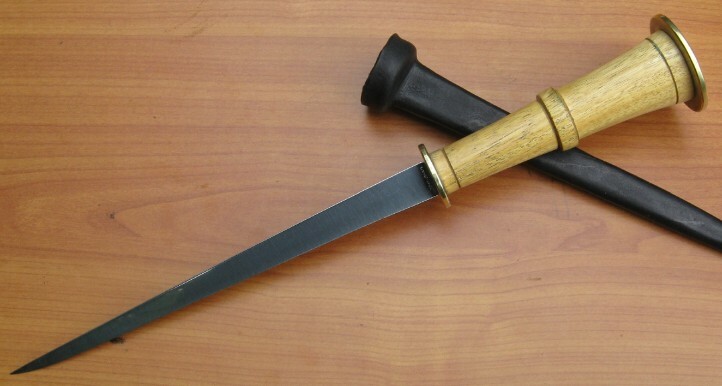 Was it made according to an original rondel dagger? And in which collection ist the original dagger to find? 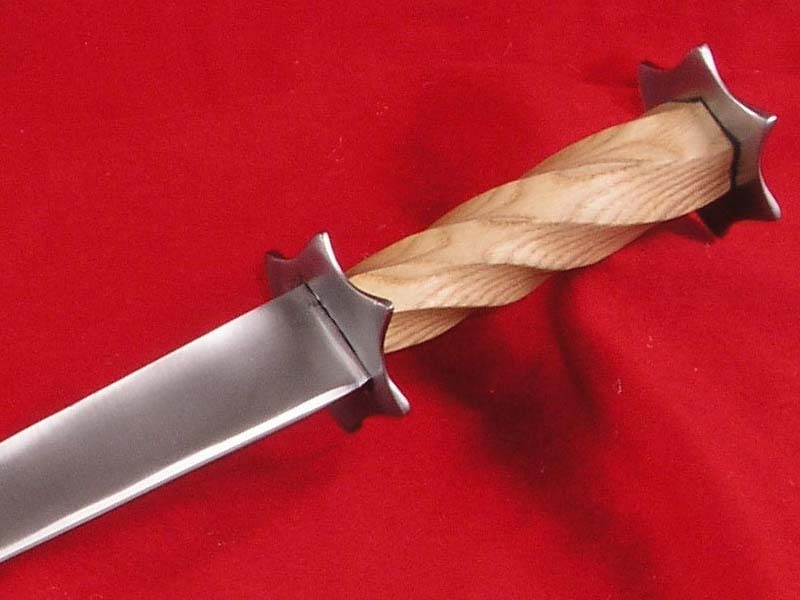 Look at our rondel dagger spotlight to see very close examples. Rondel by Tinker with Osage orange handle, very narrow but thick at guard blade and with a zero edge, so very sharp on the one edge of the triangular sectionned blade. 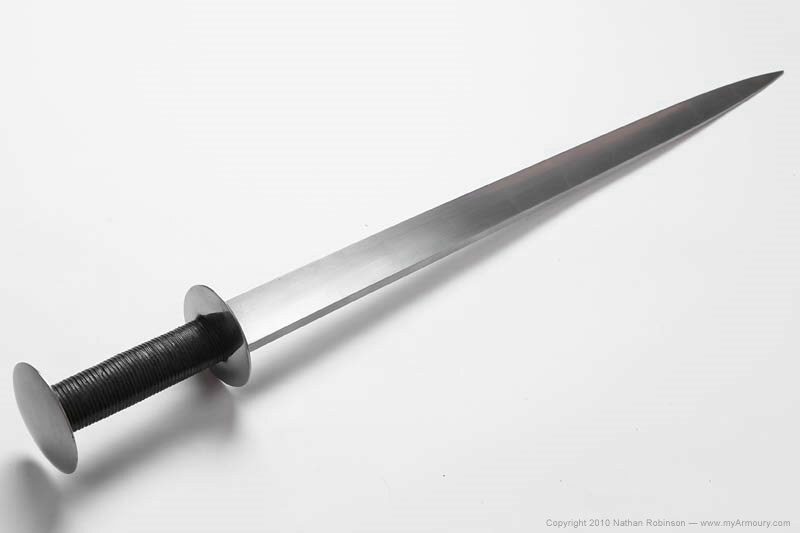 A second Rondel, custom by A & A with a 15" blade 1/2" thick at the guard and at the reinforced point. The blade from the guard to the reinforced point is semi-sharp being sharper for the first 10" of blade and turning more butter knife sharp a couple of inche from the base of the reinforced point. This one is has been blued by me. I absolutely love that piece, Craig. It looks great. Tell him I want it! If I could add to the covet list thread it would include Nathan's Arma Bohemia Composite Rondell, and Jean's custom A & A. Both are stunning! 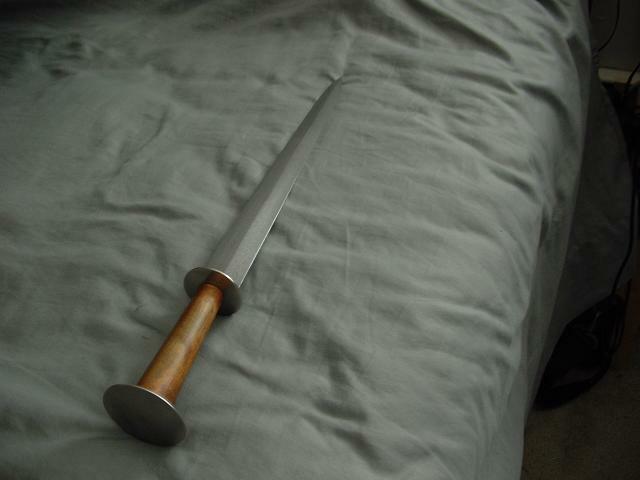 While not as beautiful as so many of the examples here, or as historically accurate, I present my rondel dagger. 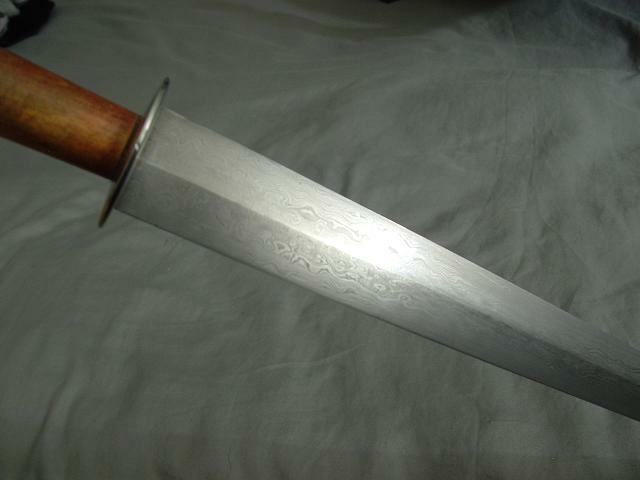 This dagger began its life as a damascus steel dagger from MRL that I had rehilted by Eric McHugh several years ago. 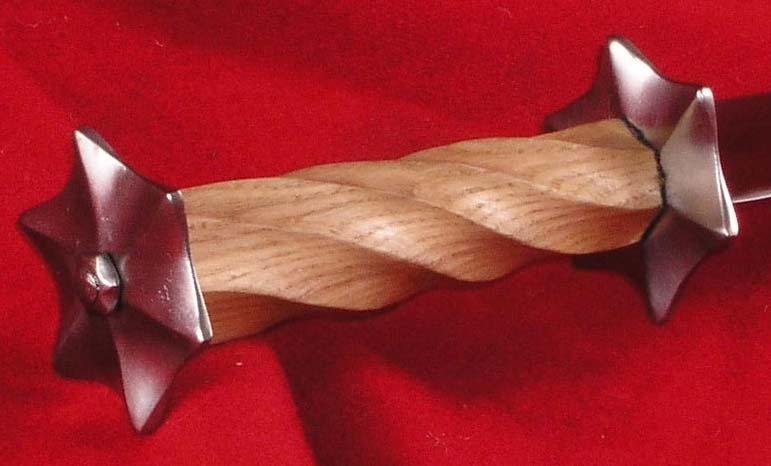 The handle is English boxwood. I know there are more out there and I hope people post them. I'm hoping to see pics of custom pieces, production pieces, high-end pieces, and pieces fit for the common soldier. 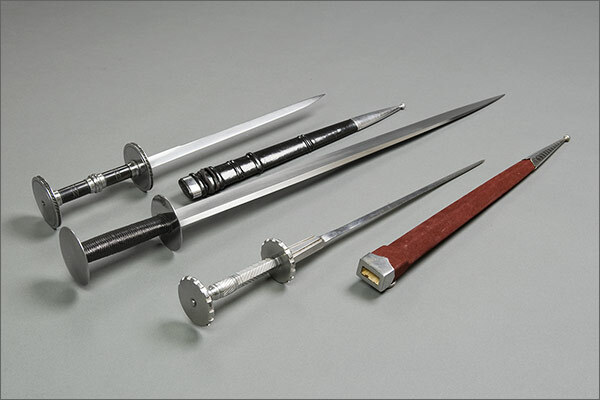 In short, any rondel daggers. Let's get some new additions here! 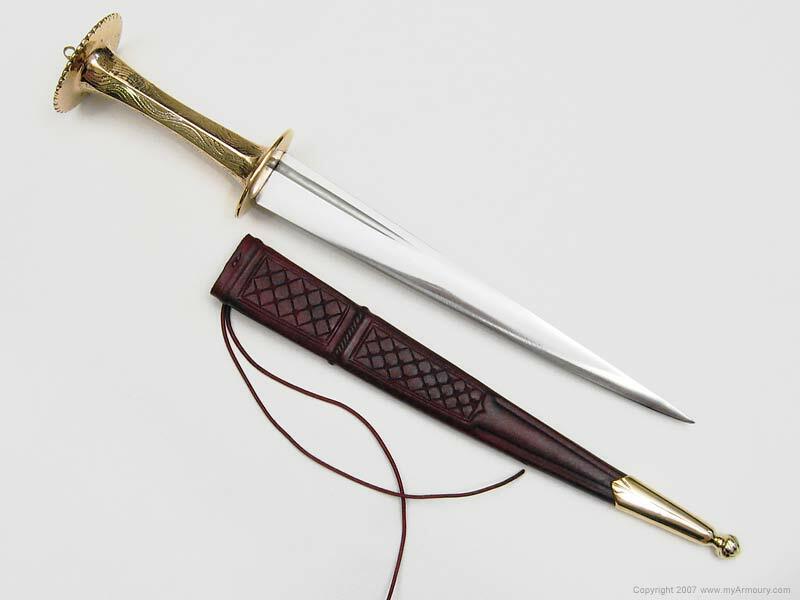 I recently acquired a rondel dagger by Arma Bohemia inspired by a 15th century antique located at the Bayerisches Armeemuseum Ingolstadt, Germany. You can see more photos and read some details in my topic. 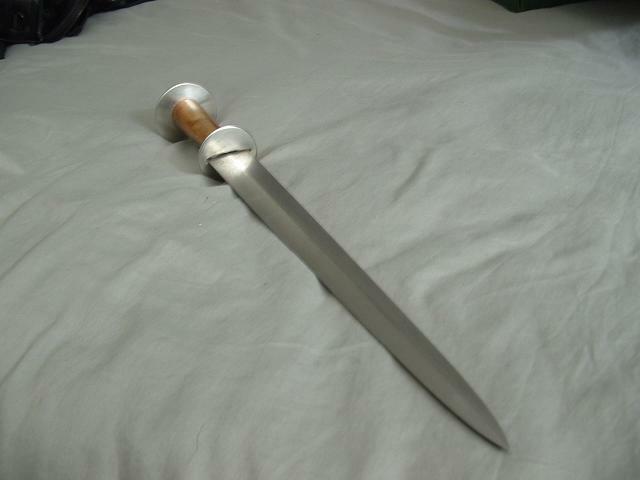 Here's my custom A&A long rondel dagger, based off on original housed in Florence. around here, this rondel is called 'wilful murder' as it causes even the most benign visitors who pick it up to daydream about what it might do.. quite remarkable. 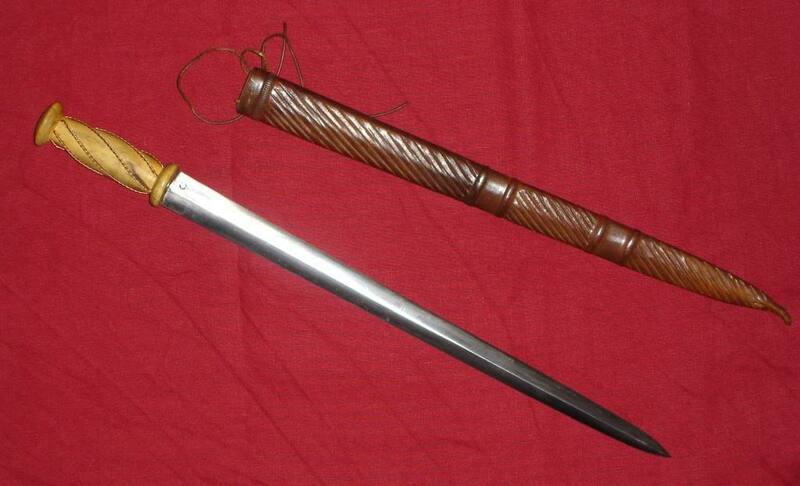 My Rondel Dagger from Manning Imperial..a very close reproduction of a Rondel from the from the Wallace Collection. just registered on this forum to post this. I picked that useless bayonet up one day when it struck me that it could be turned into a crazy medieval/fantasy dagger or heavy stiletto. 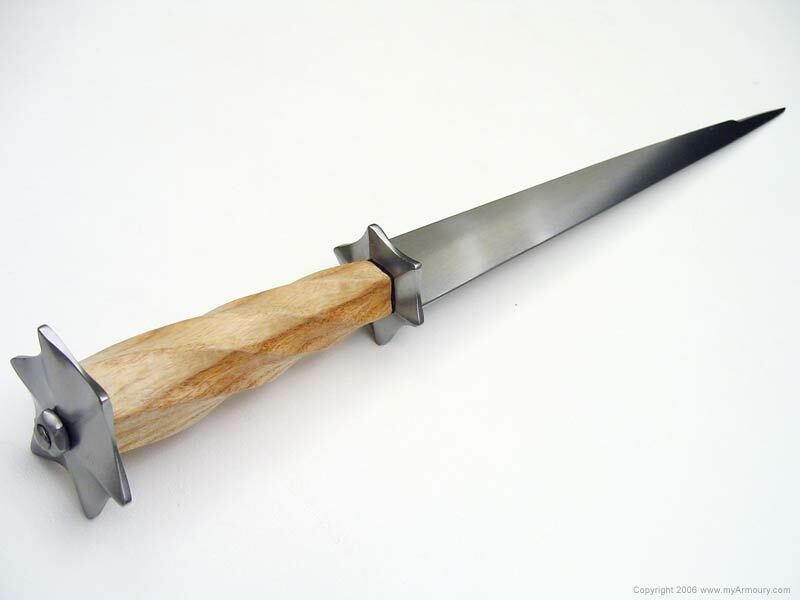 So I dug up some leftover knifemaking supplies and tools, referred my books and other sources (including this forum which helped a lot) for historical rondel daggers, and a few weekends later it ended up as a sort of late type of rondel dagger with minimalistic rondels (unobtrusive enough to allow for "forward" as well as "hammer" grip. 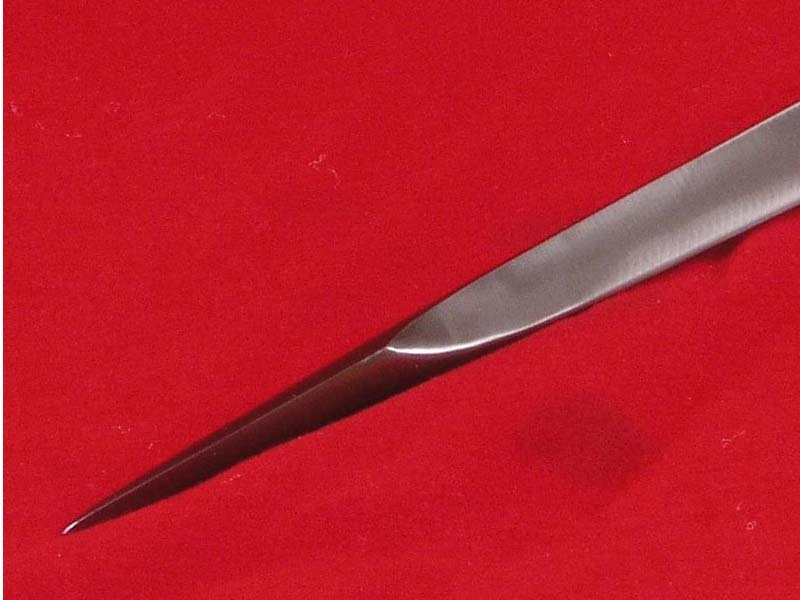 It is approximately 18" overall, heavy crusiform blade 13.5" long (blued) and 4.5" handle. 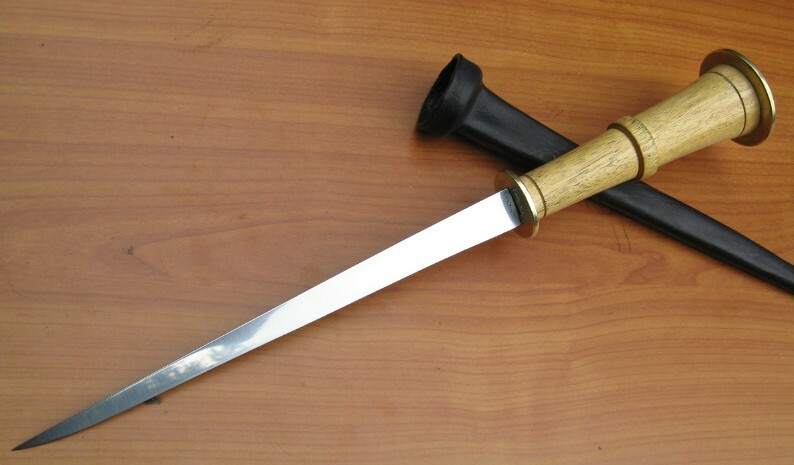 Handle is covered in ray skin, black laquered then the high points lightly sanded (a nod to Japanese tanto handles here). In crosssection it is more or less square with very rounded corners. The rondels are 1/8" brass, 1" in diameter. 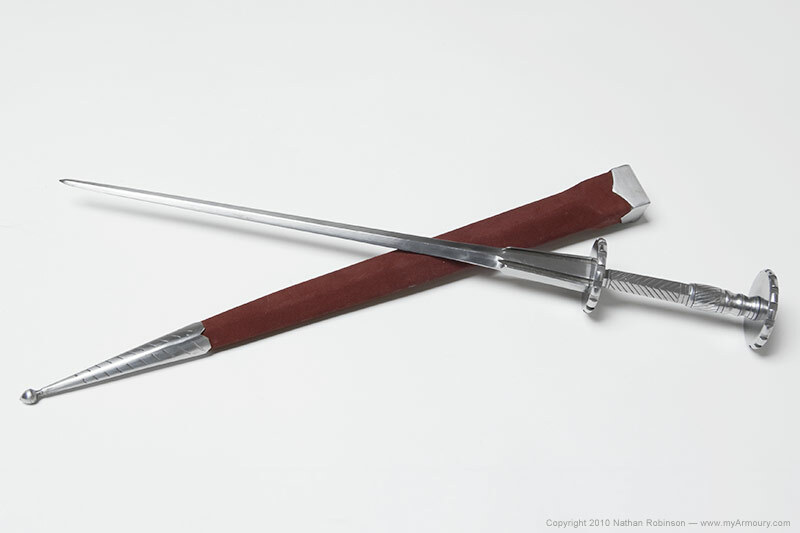 The bottom one (guard) was fitted tightly over the blade and silver soldered in place. 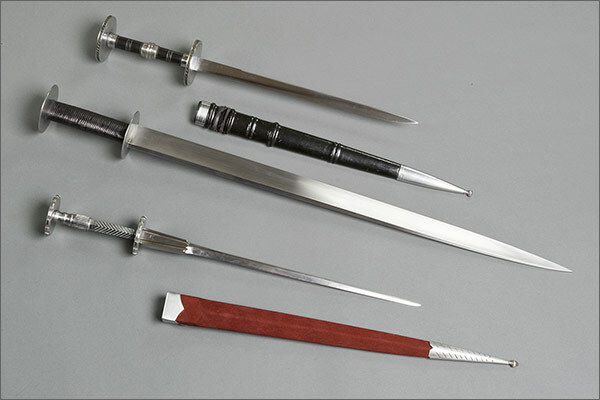 The top one (pommel) was pinned in place over an iron washer (both washer and the end of the tang are blued like the blade, for a nice contrast). The sheath is heavy leather moulded around the blade and guard, soaked in hot beeswax for hardness. The point is covered with more or less conical brass chape (soldered on the back and bottom). The top part that fits around the guard is covered by a strip of brass held with two rivets on the back. A brass D-ring for suspension strap goes through it. Overall, it is of course not exactly historical (what with the blade crossection and the grip covering), but looks to me as a businesslike weapon some knight or man-at-arms of modest means could carry on a late medieval battlefield (say Wars of the Roses period). It is certainly strong enough to pound through mail or even thin plate, or push into gaps of armor and pry the pieces apart! 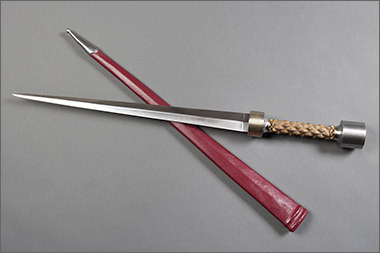 Rondel Dagger 2 - 1430-1550. 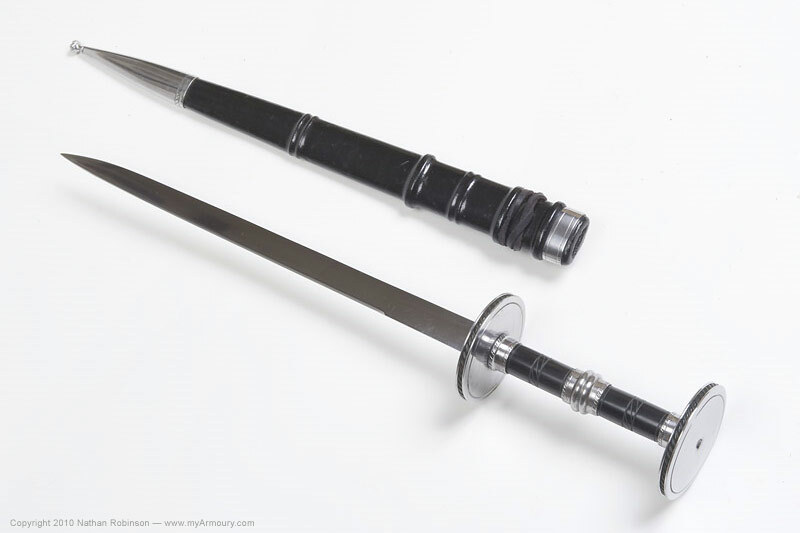 Double sided blade, steel rondels with horn inserts, horn grip, and double layer black scabbard. 13" blade length.